JACKSON – From his home, Jackson Public Schools Superintendent Jeff Beal can watch buses from three neighboring school districts roll past, picking up students going to classes someplace other than their home district. Nine districts border Jackson Public Schools, and they, along with charter schools, siphon off 40 percent of the mid-Michigan city’s school-age children. Seven miles away, in the administration office of Northwest Community Schools, Superintendent Geoff Bontrager is dealing with an opposite problem. While Jackson Public Schools has lost 10 percent of its enrollment just since the 2014-15 school year, Northwest has gained 17 percent. Both districts sought bond measures in May – Jackson to improve aging facilities to try to stem the tide of students leaving the district, and Northwest to expand to handle the influx of schools-of-choice students. Jackson’s millage passed; Northwest’s narrowly lost. Bridge Magazine visited Jackson last week as part of Bridge and The Center for Michigan’s 2018 Truth Tour, which aims to engage and inform Michigan residents on the biggest challenges facing Michigan voters ahead of this November’s statewide elections. The Center for Michigan and Bridge Magazine are traveling across Michigan on a 100-stop tour through election day in November to: Hold community discussions about Michigan issues, hold ‘Michigan Divided’ documentary screenings, distribute nonpartisan voter issue guides and make citizenship fun again with interactive public affairs games, contests, and Coney the Truth Dog. See where Truth Tour is headed next. While the Jackson economy has rebounded from recession, the city’s school district continues to hemorrhage students. The district enrolls about 5,000 students, with another about 3,400 living in the district but attending classes elsewhere. “When I got here (in the summer of 2014), we lost 314 students before I even walked in the door,” Beal said. “That’s gut-wrenching.” A loss of 314 students in one summer meant the district had lost about $2.5 million it had planned on for its budget. 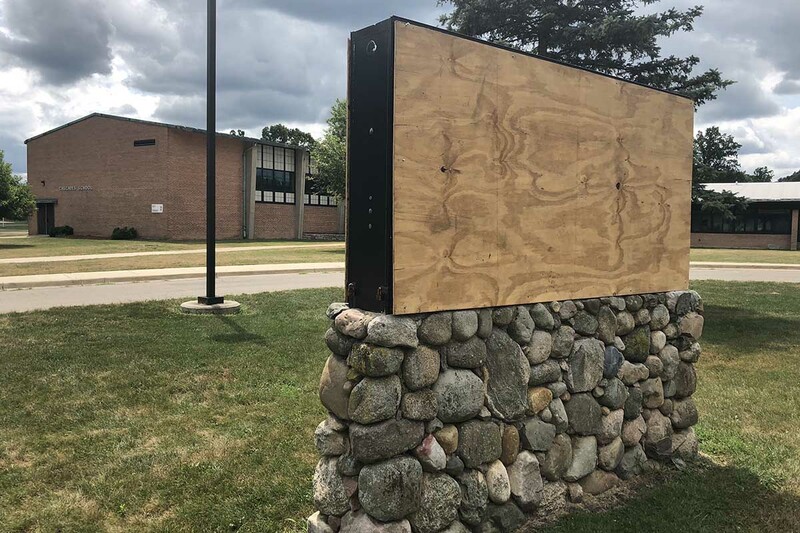 Jackson’s $86 million bond will pay for renovations in many of its schools, plus the demolition of two elementaries that will be replaced by one new building. Beal chafed at the characterization of the bond as a way to manage enrollment decline in a district with 2200 fewer students (31 percent less) last year compared to 2002-03. “There is no (money for) infrastructure provided by the state,” Beal said. “The local school districts have no choice but to go out and seek bond issues to upgrade facilities. “The last building built in JPS was in 1969. The two elementaries being replaced were built in 1952. The high school was built in 1928, that’s coming up on 100 years old. There isn’t any amount of students you could have that would keep up with” the need for building renovations, Beal said. The district does hope that improvements paid for with the bond, which include increased security in the buildings and more teacher prep, will reverse student enrollment declines. Meanwhile, Northwest Community Schools’ Bontrager is gearing up to fight for a bond issue again, this time in November, after a bond failed in May. The $25 million bond that failed in May would have funded classroom additions at all schools, district-wide parking lot and site improvements, a high school band/choir theater classroom addition, a high school information technology/manufacturing/commons remodel and secondary athletic facility improvements. Northwest finds itself struggling to manage growth, with some of that growth coming from students transferring into the district through schools of choice. The number of students from other districts going to school in the Northwest district was an issue Bontrager heard about during the lead-up to the May bond vote. 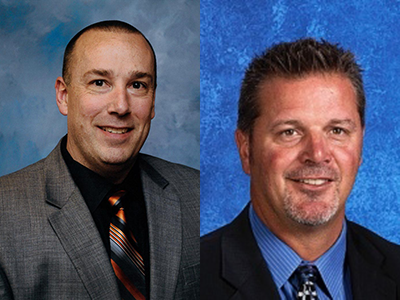 Both superintendents emphasized that dealing with families like fickle customers is the new reality for Michigan school districts. The superintendents of the 13 traditional school districts in Jackson County meet monthly to discuss issues. While they all have their own budgets and own school boards, the superintendents work together to find ways to provide educational services that work for all students, Bontrager said. Students interested in robotics can decide to enroll in Northwest schools; High schoolers who have a love for learning German can go to Jackson. The city district also accepts students from other districts looking for a wider variety of advanced placement courses. At least one district has students who swim on the Jackson swim team because JPS is the only district with a pool (one of the features being renovated through the Jackson bond issue). While charter schools are mentioned in the introduction to the article, it rapidly became all about the bond millage money that Jackson got from their voters and Northwest didn't. Yet. But charter schools don't have access to bonds or sinking funds, or any other property tax millage money except county-wide special education millages. How is it that charter schools in Michigan can do as good or better a job at educating their students as the nearby traditional public school districts, while covering all their facilities expenses out of their per-pupil operating budget, which is, by law, the state minimum funding per pupil. Is it the much lower emphasis on athletics? Is it that charters don't typically have to deal with students whose disabilities are severe enough to require self-contained classroom instruction? Although the average school building in a traditional public school district has <1 self-contained classroom in it, so that is not a huge difference. Is it primarily the active choice of parents selecting a particular school, rather than accepting the default of sending their kids to the neighboring school? Does Michigan have any data on the academic performance of kids attending neighboring traditional school districts under the Schools of Choice laws? Do kids attending any type of school that was deliberately chosen by their parents, including their neighborhood's traditional public school, perform better than those whose families choose the default? That would be information worth finding out, either through journalism or by having Michigan's Department of Education compile state-wide statistics. Your question about how charters can be as good or better is a nice hypothetical. We don't have to really consider it, though, since despite the ability to pick and choose which kids they want, charters are usually worse than publics. I wouldn't say that. My son attends DEPSA which is a charter school and is leaps and bounds better than most public schools in the area. It's not as good as maybe the best public school but it's certainly better than many of his neighborhood options. Disappointing article. Not up to the usual standards of Bridge Magazine. What is the total student capacity in the 13 Jackson districts and unknown number of charter schools? How many total students are actually enrolled? Is there an over supply? Implications? This article covers Jackson and Northwest. How many of the other 11 Jackson related districts are facing the problem of too many students or too few? Is this problem unique to these communities? Does it happen in other Michigan cities, rural, or suburban communities? What impact does it have locally and statewide? How do the problems created by too many or too few students impact learning to read, graduation, etc.? Thank you for this good report. The interview with each of the superintendents was helpful. Of course, there are some unanswered questions. A survey of parents who moved their children from the Jackson District to other districts would give more information. An observation is that complacency sometimes leads to mediocrity. This is just a question to raise without any information on my part. I'm glad the fairly new superintendent is doing some things to upgrade the schools in the Jackson district and I'm also glad that the community has approved the millage to support the upgrades. I am also wondering if Jackson has experienced a move to the outside communities as many older urban centers have. What for example would the number of school-age students be currently compared to 15 years ago? And how do the Jackson test scores compared to those in the other districts? And is the Northwest District unique in that it is drawing students not only from Jackson but from other districts in the county? And of course, there is a racial question. Being an outsider, I do not know the answers to these, but I think these issues are part of the current situation too and would reflect on the numbers of students in the various school districts. At any rate, I wish both superintendents well and what they plan to do with the schools in their districts - and the teachers, since I am a retired educator myself. I lived In Saginaw much of my life and I saw this same scenario take place and it caused the inter-city schools to have low enrollment and then they closed. We as parents and community leaders must educate one another about what is means to move your children out of the district in which they live. Your home values decrease, and it cause a domino effect, families have to find transportation to get to and from school, students fight/bully those students that out of district. It's not a winning solution. Education is the key component here for all children, but they face a multitude of other things such as safety and security, bullying, adequate staffing, problems at home, training and curriculum issues. Let's work to make this community a top notch educational experience for all students in Jackson County. Why should where you live determine the school that your kids are required to attend anymore than which grocery store you are required to buy your food? Couldn't the contention that real estate values suffer when people can remove their kids from the local district to another, could be just as easily be turned around for other districts in that living in that city doesn't automatically relegate your kids to another school, therefore real estate values improve? The superintendents should applauded for embracing their customer's choices rather than resorting to raw force. Interesting story, but very incomplete reporting. Ron briefly mentions charters, but fails to point out that charters have NO access to bond money to pay for any of their facilities, technology or upgrades. They're at a huge disadvantage compared to school districts like Jackson because they have to pay for 100 percent of their facility costs through their per-pupil funding. And yet by every metric, the charters outperform. I would also take issue with Ron's choice of words. Charters and schools-of-choice districts don't "siphon" students away from Jackson or any other district. Jackson is not entitled to those students. No district or charter school is. Students don't inherently belong to any district. The only ones "entitled" are parents, and that's a great thing. Charters enjoy preferential treatment from government at all levels and enormously more private donations than kids, and they outperform by no metric, except when the charter schools are allowed to cook the numbers. It's only because of the enormously greater support they enjoy over that of public schools that they still exist. If they'd been forced to compete on a level playing field, we'd have abandoned the experiment decades ago. I graduated from Parkside high school in 1972 and even back then the core studies were not where they should have been.I struggled with math and science and received no help even though I asked for it.I did graduate but my life would have taken a different road if I had a better education.If there had been school of choice back then I would have left Jackson schools in a heartbeat. If you'd left a school where you had to struggle for one that didn't expect you to work that hard, that would mean you were getting a worse education, not a better one. And that's the result of schools of choice. 'Uber' for schools. Marketing and low price trumps everything else. My mother, repeatedly, said: 'If it seems too good to be true, then it probably is'. Go ahead but don't be surprised that the promises don't end up being true. According to www.niche.com, it states that “Niche combines rigorous analysis with authentic reviews to highlight the best schools, companies, and neighborhoods.” I have no idea what type of reputation they have on what they report, but their methodology seems to be comprehensive, see https://about.niche.com/methodology/best-public-high-schools/. A summary of Jackson Public Schools, states that it has 5,180 students, grades PK, K-12 with a student-teacher ratio of 18 to 1. According to state test scores, 22% of students are at least proficient in math and 41% in reading. Average graduation rate of 68%; 47% white, 35% African American; 60% free/reduced lunch; average teacher salary, $67,813. Jackson Public Schools can be found at: https://www.niche.com/k12/d/jackson-public-schools-mi/. A summary of Northwest Community Schools, states it has 3,080 students in grades PK, K-12 with a student-teacher ratio of 19 to 1. According to state test scores, 35% of students are at least proficient in math and 57% in reading. Average graduation rate of 77%; 85% white, 3% African American; 44% free/reduced lunch; average teacher salary, $55,881. Northwest Community Schools can be found at: https://www.niche.com/k12/d/northwest-community-schools-mi/. It would be interesting to learn the racial makeup and poverty rank (free/reduced lunch) of the students that Jackson Public Schools have lost over the past 10 years or so. But based on my brief view of data, Jackson Public Schools has the highest percentage of student/family poverty as well as the highest percentage of minority Americans. So, are these two schools who share a common border becoming re-segregated or segregated based on their racial makeup and family incomes? And if so, is this what is causing the loss of students at Jackson Public Schools to neighboring school districts? Often charter schools are run by for profit companies. These companies often pay their employees less than public school employees in my experience. Research shows that charter schools test scores run about the same or lower than public schools. Schools of Choice doing exactly what its creators wanted to happen... siphon students from some districts so that they'd ultimately fail while others grow. Albion suffered the fate that will eventually befall Jackson. It's my belief that we'll end up with a single district in each county when this ultimately plays out. That will eliminate "redundancies" (superintendents ad other administrators) while also reducing local control and bring unknown consequences. Somewhat shallow article on a Jackson (and others) Concern which dictates more research. Not mentioned that Northwest just blew through a $31 million dollar millage three years ago, a first one in at least fifteen years! Many of the 'asked for' equipment, buildings and air conditioning was either implied or supposed to be part of the original passed millage. Three years later the 'supplemental millage' was defeated by a slight margin (44, I believe). while the dust from that defeat had not even settled, Northwest came back with a vigor to say since it was a slight 'defeat', we are going to 'carbon copy' the defeated plan again with no apologies or 'less in content' to possibly satisfy some naysayers! Referring to county wide concerns, this 'student/district shopping' has to be addressed! It is a 'Robbing Paul to Pay Peter' syndrome within the county! What is not spoken is the costs for billboards, tv and radio spots that comes from all of the county school districts of their budget(s) that participate in this marketing scheme. But then again incoming students are worth at least $7K per pop, so whats money! When with the bubble burst and the resident taxpayers with still be on the hook for potential pie in the sky unproven plans.